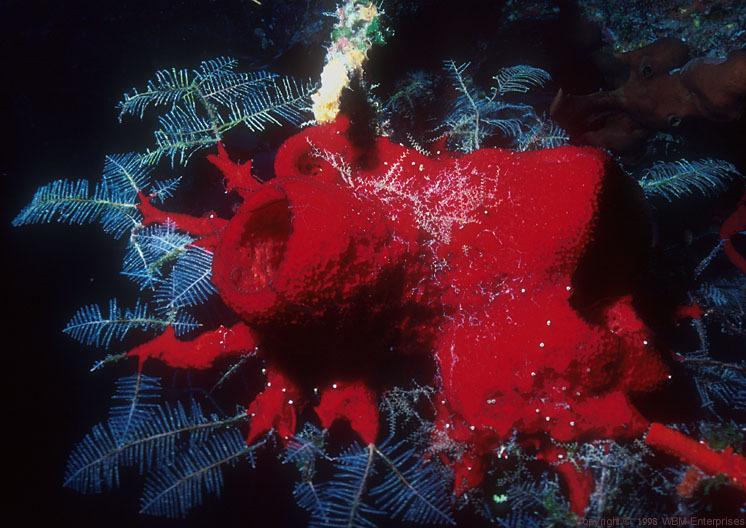 Red Cup Sponge (Mycale sp.) and Feather Hydroids (Sertularella speciosa) on a Black Coral Tree (Antipathes sp.). * The above image shows portion of an unusually rich marine habitat. We found the Red Cup Sponge (Mycale sp.) clearly making the transition from cup form to encrusting form, and sharing the environment with white Feather Hydroids (Sertularella speciosa), and a few examples scattered here and there of smaller Hydroids, perhaps (Cnidoscyphus marginatus). The mass of the sponge was attached to a large Black Coral Tree (Antipathes sp. ), and nearly surrounded by a complicated conglomeration of the Red Rope Sponge (Haliclona rubiginosa). The pale yellow sponge in the upper center is probably (Ulosa hispida). In the osculum of the Cup Sponge can be seen a few arms of Brittlestars, (Ophiothrix sp.). The dots of white are the entrances to the tubes of unidentified Serpulid Worms.